After our group’s recent visit to the distillery in St. Antonin I thought it may be interesting to our members to know more about the history surrounding Lavender and Lavandin essential oil. There are three native Lavanders growing in the south of France. Along the coast Lavandula stoechas (with large petal like sterile bracts ((rabbit’s ears)), in the hills behind the coast up to 600 metres altitude, Lavandula latifolia (Spike Lavender) and in the Haute Provence, above 600 meters, Lavandula angustifolia, commonly known as Lavender. Ever since the parfum industry developed in Grasse, farmers have been gathering Lavender in the hills of the Haute Provence. It was a cottage industry at the time. Families and later on itinerant workers from abroad would come in July and August to pick the Lavender. 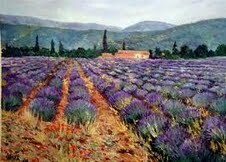 Very often the lavender would be distilled in an Alambic at the side of a field. At the time Lavender was being picked by hand, it was mostly Lavandula angustifolia (Lavender), but between 600 to 700 meters, cross pollination took place between Lavandula angustifolia (Lavender) and Lavandula latifolia (Spike Lavender). The gatherers did notice that some Lavenders were taller and the flower spike was larger, but they did not really understand the reasons for it. As science progressed the reasons for the differences were recognised. They named the Lavender created by the cross pollination “Lavandin”, the official name is Lavandula x intermedia. Lavandin ,they realised, was sterile and could only be propagated by taking cuttings. Lavandin has an uneven number of chromosomes hence the inability to produce fertile seeds. It was in the 1920’s in Grasse that the interest to produce new types of Lavandin grew, but it was Père Abrial , in the 1930’s, who produced the first Lavandin that became very interesting for the industry. The Lavandin carried his name Lavandin “Abrialis” . It became so popular that 2/3 of all the fields were planted with this variety. It started developing an illness, in French it is called “dépérissement”, a plant fatigue one could say and was replaced by a new variety, Lavandin “Super.” Nowadays Lavandin “Abrialis” takes up 10-15% of the Lavandin production. The same illness started to affect Lavandin “Super”. The reason for this “fatigue illness” was the lack of crop rotation. When the Lavendin became less productive it was just replaced with new young plants. Nowadays several different cereal crops and a green manure crop are planted for a period of four years after digging up an old Lavendin field. In the years 1972-1975 a new Lavandin was born. It was selected by M. Grosso, from Goult in the Vaucluse. It is a very large plant, with a huge flower stalk, producing lots of oil, in addition it is quite robust, it was called Lavandin “Grosso” after its selector. 3/4 of the Lavandin one sees growing nowadays is Lavandin “Grosso”. The plateau of Valensole is almost exclusively planted with the “Grosso” variety. There are other Lavandin clones less well known like 41/70, Special Gregoire, 33/70 and Sumian, but the previously mentioned “Abrialis, Super and Grosso” are the most important. Although this development seemed very interesting for the parfum, soap and detergent industry, Lavandin does not have the same medicinal qualities as Lavendula angustifulia (Lavender). Lavandula angustifolia (Lavender) is nowadays produced in the north of the region, in the Diois, around the town of Die and in southern direction towards to Banon. In the Alpes de Haute-Provence around Digne, Barrême and in the Hautes Alpes, north-east of Gap. It needs an altitude above 600-700 meters to flourish well. There is a cloned variety of Lavender called “Maillette”, which does not produce quite the same quality of oil, but is interesting to the industry because of its yield. Lavandula angustifolia (Lavender) is sown. The quality of Lavandula angustifolia (Lavender) essential oil is measured in the amount of principally two constituents in the essential oil named “Linalyl acetate” and “Linolol”. For Lavandula angustifolia (Lavender) the French Pharmacopeia states that it should contain between 35-55% “Linalyl acetate” to be considered Lavender essential oil. Distillers located in high altitude produce oils of higher “Linalyl acetate” content, not only because wild lavender plants growing at high altitude contain more esters but also because of the fact that at high altitude the boiling point is lower. It is not 100 degrees C but perhaps only 92 to 93 degrees C. Distillation at lower temperatures produces a better oil, it could contain up to 70 percent “Linalyl Acetate”. Essential oil from Lavandin, because it produces more oil, is cheaper than essential oil from Lavandula angustifolia, but it is not of the same quality. As an example, oil from Lavandin “Grosso” contains between 28-38 % “Linalyl acetate”, Lavandin “Abrialis” contains between 20-29% “Linalyl acetate”. In addition all the Lavandins have inherited from their other parent “Lavandula latifolia (Spike Lavander) Camphor in their oil, which makes it less pleasant to smell. Where in Lavandula angustifolia there are only trace elements of Camphor, in Lavandin ‘Abrialis “it is 7-11% and in Lavandin “Grosso” between 6-8 %. What makes essential oil of Lavender so unique, compared to say “Tea Tree” oil, is because it has a regulating effect on the nervous system. It balances and harmonises. It adapts itself to conditions, restoritive in cases of listlessness or weakness, yet calming in hyperactivity and agitation. In addition it has fungicidal, preventive and immuno-stimulant qualities although not as pronounced at Tea Tree oil. It can be used neat to treat burns, cuts and spots. Lavandin “Abrialis” is a good anti-infectious oil and has sedative properties. Ce mois de juillet n’aura pas confirmé l’été caniculaire annoncé par certains météorologistes. Nous avons bénéficié de belles pluies pour nos jardins et de températures plutôt printanières. 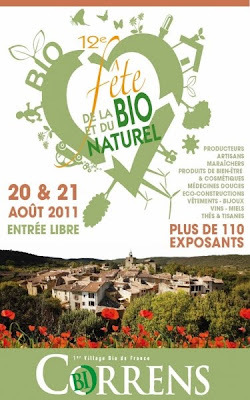 La plupart des plantes s’en accomodent fort bien. Mais certains légumes tels les courgettes ou les tomates exigent de la chaleur. Ils ne nous ont offert pour l'instant que très peu de fruits mûrissants. · Au verger, taillez en vert les excès de croissance pour favoriser la mise à fleur de l’année prochaine. · Supprimez les stolons des fraisiers qui épuisent les pieds mères. Vous pouvez les mettre en pot en vue d'une plantation en septembre. · C’est le moment de greffer à œil dormant les pommiers, poiriers, pêchers et abricotiers. · Bouturez les fleurs des balcons : Géraniums, Scaevolas, Fushias… mais aussi les arbustes et rosiers du jardin. · Tondez peu même si la pluie fait pousser l'herbe. Le sol sèchera moins. · Les rosiers : si vous avez adopté notre méthode homéopathique, continuez les applications foliaires tous les 15 jours et de préférence tôt le matin. Taillez les fleurs qui fanent et les éventuelles feuilles tachées. · Les annuelles fleuries vous ont fait rêver ! Semez dès maintenant les Eschschlozias, Pieds d’aloutettes, Julienne des jardins, Oeillets ou Roses trémières dont vous aurez glané quelques graines dans des jardins voisins ou amis. Elles fleuriront très tôt au printemps. · Divisez ou plantez les Iris pendant ce mois d’août. · Apportez un peu d’engrais organique aux plantes en pot pour soutenir la végétation jusqu’à l’automne.